Control groups for customer loyalty programs; an impossible dream? 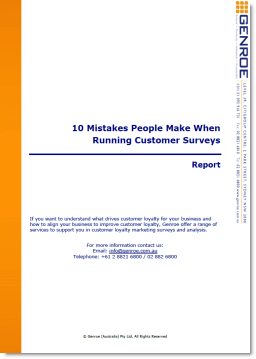 Measuring the effectiveness of customer loyalty programs has always been a bit of a problem. But even if members exhibit all of these behaviours, how can you identify if it is because of your customer loyalty program investments, or your products or even your other marketing efforts? In other marketing channels we add credibility to claims of causality for our campaigns by holding back a portion of our customers in a control group. We try to ensure that this group is exposed to everything except the campaign we are measuring. This way, if there are differences in responses between the control and test customers it must be due to the campaign because that is the only difference. This is a well understood discipline. how do you exclude some customers from your program? Especially those high value customers most likely to benefit from the program and therefore most likely to join and the most interesting to measure. When we launch a program we want everyone to sign up and present their card every time they shop right? if you even could exclude them, how would you track their behaviour when they do not carry your loyalty card when they buy? program influence is long-lived and continuous. This makes it difficult to determine when to measure to allow for other marketing activity that may complicate results. There is no need to give up on measurement and resort to blind faith however. Traditionally we have relied on correlations between program membership and spending, tenure, share-of-wallet (and a touch of faith) to pile on enough circumstantial evidence to make a case for program return on investment. This is a good start but not completely satisfying for us numbers geeks. There is a group of customers in many programs that approximate a control group. While these members do not completely solve the measurement problem, they give additional and useful insight into how your program is operating. This ‘control group proxy’ works in annual or fixed period programs, (where points expire) but not at all in programs that include automatic redemptions e.g. the quarterly issue of gift cards if you have enough points. To use this control group approach, allocate members into tiers based on the value of their spending in the program and you will typically find customers in each tier who have reached rewards thresholds – they could receive rewards simply by asking – but who have not bothered to redeem. We call these members ‘non-redeemers’ in the (non-religious) sense that they do not redeem their points for rewards. Generally if you interview these (especially high value) non-redeemers they report a lack of engagement, an ‘I don’t care’ attitude to the program; even though they are members, it does not influence their behaviour. They just let their points expire. Not a perfect control group, but if we view non-redeemers as our control group, comparisons within each customer value tier between redeemers and non-redeemers give us a better indication of what lift in customer value the program is actually delivering. These comparisons work best in the high value tiers because the lower tiers include new and low spending members who are yet to achieve rewards but will redeem when they do. This approach is not perfect because individual customers may move into and out of the non-redeeming group, which makes their independence from program effects questionable. But the comparisons at best show the differences between a group of customers who pay attention to the program and a group who do not, despite being enrolled. Next time you try to quantify the return from your loyalty program try looking at the difference in tenure between redeemers and non-redeemers of the same value. In our experience, for example, in credit card loyalty programs redeemers stay in the franchise 40% longer than non-redeemers. From there it is not hard to calculate the discounted value of that extra future cash flow and attribute it to your program.